This post is about making beer, but not just any beer. The style is called a Flanders Brown Ale or Oud Bruin. This beer is a special, wine-barrel aged beer with a tart fruitiness that comes from lactic fermentation. The base beer has to account for this transformation in the recipe and brewing process. I have been a homebrewer for over 30 years. I got my start during my last year studying electrical and computer engineering at Lehigh University. Time and funds are often tight for a student, so I did a lot of my holiday shopping at the school book store. There I found two books that would change my life. One was Michael Jackson’s New World Guide to Beer, and the other was Making Beer by William Mares. I bought these books as Christmas gifts for my beer-loving older brother. I read over these books before gift wrapping them, and decided that we needed to try making some beer. So we brewed a batch over winter break in January 1985, and the rest was history. Brewing beer is a lot like cooking. It involves a recipe and a process. Both affect the end product. Over the years, I had brewed a lot of styles, mainly trying to emulate the classic styles that I enjoyed in those days. Then, in 1992, I served as my local club, BURP (Brewers United for Real Potables) Minister of Culture. This meant I ran the monthly beer style competitions, and I started a large local homebrew competition, the “Spirit of Free Beer” which still occurs annually. One of the club members was a huge Belgophile. He loved Belgian beer and wanted to do things focused on Belgian styles. Not too much was locally available at the time, so we needed him to teach us. He taught us about the various styles of Belgian beer and shared samples he had hand carried from Belgium. We decided to host a big Belgian style homebrew competition to get more folks educated about the styles and get them brewing these interesting beers. 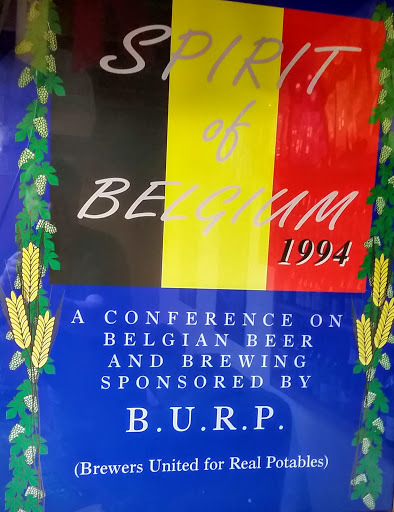 So, in 1994, we organized the first “Spirit of Belgium” homebrew competition and conference. We had lectures from experts from around the world, beer tastings, beer and food pairings, and a large homebrew competition limited to Belgian beer styles. Liefman’s Goudenband was one of my favorite Belgian beers. It is a Flemish brown ale with a tart flavor profile and fruity maltiness. I wanted to make a beer in this style. Four of us joined forces to produce this style of beer. We brewed about 10 gallons. 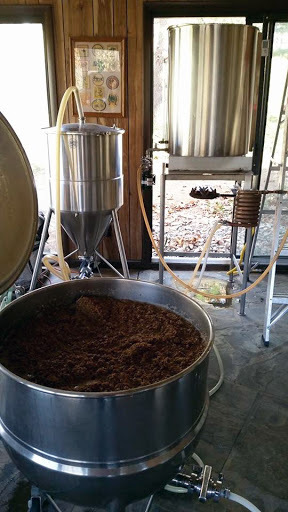 We split the batch of beer wort, the sweet extract of the mashed malt, into two batches. Both were fermented with the same brewer’s yeast, but then each batch was treated with a different lactobacillus culture. One was from a culture obtained from Liefman’s, and the other was a mixed lactobacillus culture that I believe was probably a cheese culture. In the end, both made great beer, each with its own unique nuance. 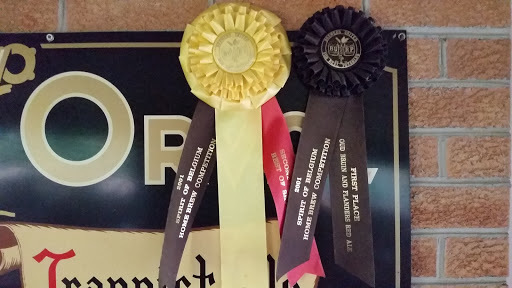 That beer went on to win quite a few ribbons, both because it was good and because it was unique. Years passed and I continued to brew beer. There’s always something new to learn, and exposure to the creations of others is one of the great benefits of being in a local club. I met a group of homebrewers from BURP who had gone together and purchased some used wine barrels. They were making some wild beers that had a lactic sour flavor along with an infusion of oak and residual wine flavor from the barrels. The results were great, so I jumped in and got a barrel myself. I got a used red wine barrel from a local Virginia winery. I gave the barrel a good cleaning and filled it with water to make sure there were no leaks. The barrel holds about 60 US gallons, so I had to brew twice to fill it. My current system makes about 30 gallons per batch. The recipe here is for 30 gallons. I called the beer Divine Wind because my Belgophile friend called our original experiment a kamikaze mission. The beer is very malt-forward with a lot of complexity. That malt complexity will transform with the fermentation process, becoming even more complex. There is a light amount of kettle hopping, but it is important to use high quality hops to add just the right bittering and flavor components to subtly stand up to all of the malt. Before my brewing day, I make sure all of my equipment is spotlessly clean and ready to go. Because there is so much malt in this beer, I crush it a day in advance using my roller mill powered by a heavy duty drill. I also fill my boiling kettle with water filtered to remove the chlorine. Overall, I will need to heat about 50 gallons of water. 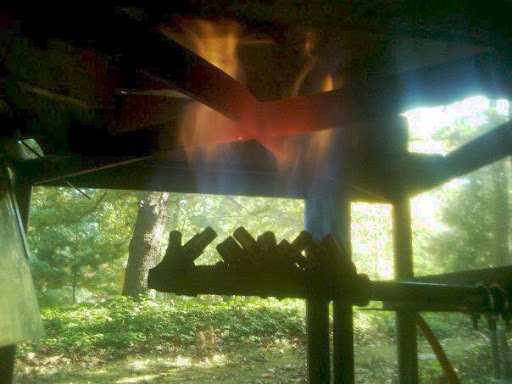 The brew day starts by firing the burner and heating the mash water to 180˚F. I mix this water into the crushed malt in my mash tun, a converted steam fired soup urn with a false bottom. I make the mash pretty thick for this beer because there’s not a lot of space in the mash tun for this much malt and I need to be able to add more hot water if the temperature drops. I would like to hit between 150-152˚F. The mash needs to hold this temperature for about 60 minutes. I stir the mash and check the temperature about ever 15-20 minutes. About halfway through the mash, I top up the water in the boiler and heat the kettle again. This time to at least 185˚F. At the end of the mash, I take a taste and make sure it has converted the starch to fermentable sugar. If I have held the mash temperature to around 150˚F and mixed the mash over time, then this is pretty much a given. I mix the rice hulls into the mash bed. They will keep the mash from compacting and halting the flow of runoff. The heated water for the lauter is pumped to a holding tank and some is pumped into the mash tun to raise the temperature. Now we want the temperature to be about 168 ˚F to halt enzymatic action and to get all of the sugars into solution for extraction. I start the runoff from a drain in the bottom of the mash tun, and recirculate the runoff until it runs pretty clear. This means there is a good filter bed established. Then the flow of the lauter is adjusted to a slow stream. Hot water is fed on top of the grain bed, and sweet wort is collected from the bottom. I collect the wort runoff in small buckets to observe how things are going. As each bucket is filled, it is replaced with an empty. The full bucket is carefully emptied into the now empty boiling kettle. I need to get about 40 gallons of wort because some will be lost in the process by evaporation or left in the equipment (hoses, bottom of the kettle, taken up by hops, and eventually part of a discarded yeast slurry). As soon as there is enough wort in the boiling kettle, the burner is fired. This early firing generates some kettle caramelization (Maillard reaction) which also adds to the flavorful complexity of the finished beer. When all 40 gallons are in the boiler (and more than that can be extracted from this much malt, but then the boil time has to be greatly extended to reduce the volume and increase the specific gravity), the hops are added in one addition. I start a timer to boil about 60 minutes. The boil is vigorous to isomerize hop compounds, reduce the beer volume, and concentrate the wort to the desired specific gravity (Brix). The burner is shut off at the end of the boil, and the wort is pumped through a counterflow chiller to cool it to yeast pitching temperature. The chiller is concentric copper coils with the hot wort flowing inside the cool tap water flowing through a larger coil in the opposite direction. Regulating the flow of the wort allows it to transfer its heat to the tap water. I run the heated tap water outside to use for cleanup and then to water trees. The chilled wort goes into my stainless steel conical fermentation tank for primary fermentation. I draw off a sample to taste and to check specific gravity with a refractometer. The specific gravity for this beer is 16˚ Plato. Based on the typical attenuation from the ferment, this yields a beer about 7.3% alcohol by volume. 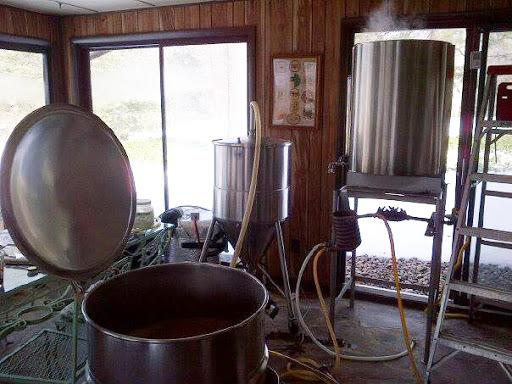 The unfermented beer in the stainless steel tank usually goes in about 80˚F. I have an auxiliary glycol chiller connected to a jacket on the fermenter to lower the temperature more if needed. The Safale yeast slurry is pitched into the wort, and I bubble it with a bit of O2 to jump start the yeast. Fermentation begins within hours. Primary fermentation is maintained at about 65˚F for about two weeks. 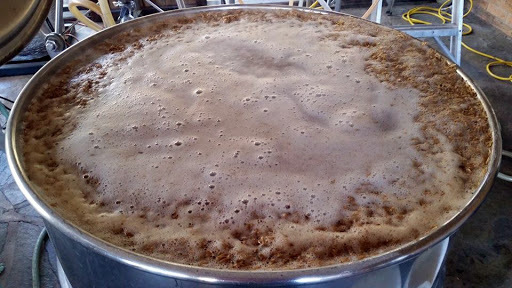 The purpose of a good primary ferment with brewer’s yeast is to make sure no spoilage bacteria get a foothold. There is too much work and cost in this beer to leave things to chance. Once the yeast is established, then it is much easier to control the wild part of the ferment as the process has given an advantage to the yeast to this point. As fermentation slows, the beer can now be transferred to the oak barrel. It is still actively fermenting at a slow rate. The beer is drawn off from the bottom of the fermenter, so any settled yeast is removed before the transfer. We do not want a load of yeast sludge in the barrel as it will autolyze and create off flavors in the finished beer. 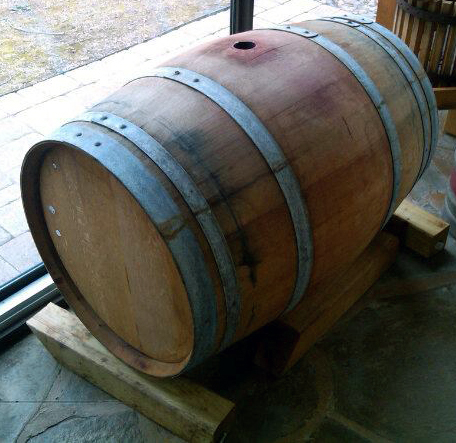 The French oak wine barrel is loaded with bacteria. We want to encourage lactobacillus and limit or exclude acetobacter (no one wants 60 gallons of malt vinegar), pediococcus, wild yeasts such as Brettanomyces, mold, etc. The best way to do this is to limit exposure to air, keep the barrel full, and take samples to gauge the beer’s progress in the barrel. Lactobacillus works slowly. The flavor of the beer in the barrel continually evolves. I use a wine thief to draw samples. You can see the lactobacillus at work as a pellicle develops on top of the surface of the beer in the barrel. I have found that it takes about 18 months for the flavor to fully develop. As you can see, there is quite an investment in making this beer something special. When the beer is ready to drink, I draw off five gallons into a soda keg, carbonate and serve. It is crystal clear, copperish-brown in color, develops a nice lacy, lasting head, and has a smooth malty flavor with a juicy tartness. It’s just sour enough to get your attention. 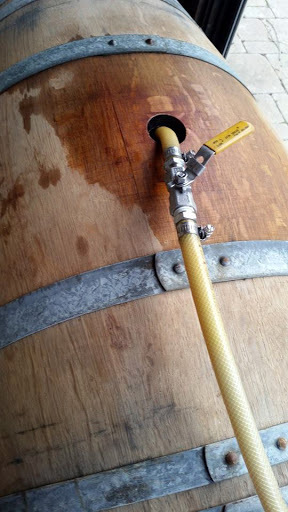 The oak and residual red wine flavor from the barrel naturally connect to the flavors of the beer. A delicious masterpiece that goes well with food or refreshingly stands on its own. For a special treat, once a year I draw off five gallons and let it sit on 2-3 gallons of raspberries from my garden for 2-3 months. 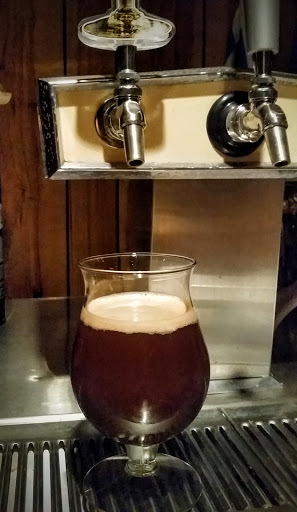 Having extracted all of the flavor from the fruit, the beer is racked off the fruit, allowed to settle a bit more, and then racked and kegged. This beer is as special as it gets, Cuvée Brut, love in a glass.